History data are stored in the table [yourKankuruDB].dbo.k_dashboard_historique. These data are collected by the Dashboard. Data rentention : 1 point every 10 minutes during 50 days. Disk : The disk free space. You can select in the dropdown list your disk. File : The total or the free space in each file. How to enable/disable history ? 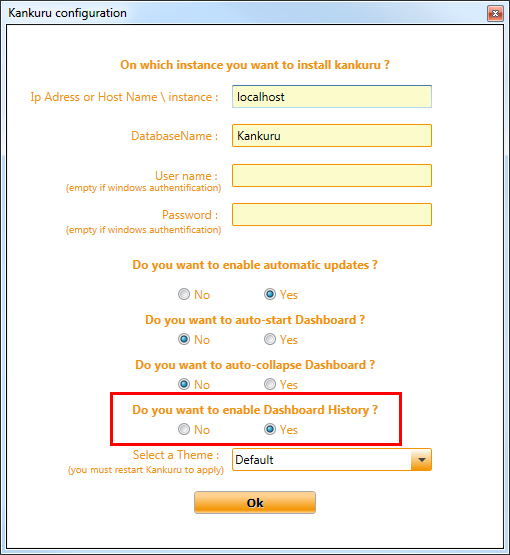 You can chose to keep data in the Kankuru database in the configuration window.